Theranostics – a combination of the words therapeutics and diagnostics – describes a treatment platform that combines a nanotechnology cancer diagnostics test with targeted therapy based on the test results, i.e. a step towards personalized medicine. 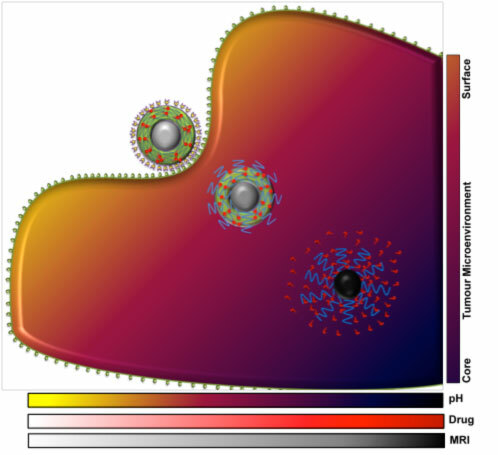 Making use of nanotechnology materials and applications, theranostic nanomedicine can be understood as an integrated nanotherapeutic system, which can diagnose, deliver targeted therapy and monitor the response to therapy. In the report, we fabricated a novel pH-triggered tumour microenvironment sensitive order-disorder nanomicelle platform for smart theranostic nanomedicine. Our findings illustrate the potential of these biocompatible smart theranostic micellar nanostructures as a nontoxic, tumour-target specific, tumour-microenvironment sensitive, pH-responsive drug delivery system with provision for early stage tumour sensing, tracking and therapy for cells over-expressed with folate receptors. The outcomes elucidate the potential of smart cancer theranostic nanomedicine in non-invasive real-time diagnosis, targeted therapy and monitoring of the course and response of the action before, during and after treatment regimen.